Long before Lululemon, Bikram Hot Yoga and the ubiquitous downward facing dog, yoga was being taught in small studios in San Francisco, New York and the Hudson River Valley. Just as Lululemon struggled to contain the reputational damage of the ‘sheer pants’ scandal and Bikram Choudhury became embroiled in lawsuits, the man who opened the first yoga studios in the nation back in the early 1900’s was a lightening rod for controversy. 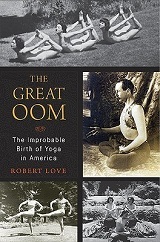 The story of how yoga as we know it came to America is told in a fascinating and very readable book, The Great Oom: The Improbable Birth of Yoga in America by Robert Love. The man the tabloid press of the day branded ‘Oom the Omnipotent’ was born Perry Baker in small town Iowa in 1876. Before he was 20 he’d changed his name to Pierre Bernard, met an Indian mystic named Sylvais Hamati, and attained notoriety by subjecting himself to tongue and lip piercings (allowing his lip and nose to be sewn together!) while apparently feeling no pain in a self-induced trance. Bernard became a serious student of Hatha yoga derived from Vedic and Sanskrit teachings at a time when most Americans were even more ignorant of religions other than bedrock Christianity than they are today. This was even more remarkable since British India regarded Hatha yoga, with its well-known asanas or postures, as declasse. Bernard fully embraced the Tantrick (or Tantric) forms of practice that included sacramental sexual union: a massive reputational risk in the Puritanical climate of the 1900’s (or even the more tolerant 1970s, as other teachers were to discover). Despite, or perhaps because of, the success of his teaching in helping society ladies and the idle rich find purpose in life, he was pursued in court and hounded in the press. He moved from San Francisco to Seattle, and eventually settled on the East Coast, first in Manhattan then in the rural Hudson River Valley village of Nyack, where he became a landowner and opened a country club offering members everything from daily yoga to enemas, circuses and all-night parties. He counted several members of the Vanderbilt family among his patrons. Among his detractors were blue blood families convinced their daughters were being seduced by a charlatan. Charges ranged from indecency (holding classes where female students shed girdles and garters for something more free form, although a world away from Lululemon tights) through to running a white slavery operation (one of the pet fears of that age). The man who Alan Watts — perhaps recognizing a kindred spirit — described as a “phenomenal rascal master” influenced the next generation of yoga teachers. These included Ida Rolf, the founder of ‘Rolfing’, and Bernard’s wife Blanche DeVris, who taught yoga to Anthony Quinn and Henry Fonda among others. Bernard died in solitude in 1955, having made and lost multiple fortunes, created a private zoo, sponsored baseball teams, built the finest library of esoteric literature of the time, championed the study of Sanskrit, and much more.